As someone who lives amid yogi circles, the words love, kindness and compassion get used a lot. However, I’m finding more and more that we use these words when talking about how we treat others…and maybe not so much when we talk about how we treat ourselves. Let’s break it down for a moment with some definitions, compliments of Merriam-Webster Online. Compassion: a feeling of wanting to help someone who is sick, hungry, in trouble, etc. My question is…how do we turn the mirror on ourselves? How do I become the person that I have strong affection for? How do I become the person that I want to help and bring happiness to? How do I become the person I want to help when I am sick, hungry or in trouble? I think it is pretty easy for those of us in yogic circles to talk about love, kindness and compassion. I believe it becomes even more significant when we can share how we turn these things in on ourselves. That we love ourselves unconditionally. That we are kind to our bodies, spirits and minds. That we take care of ourselves when we aren’t feeling one hundred percent. Turning it around takes courage. It takes strength. That courage and strength to put ourselves first is immense and should not be underestimated. So many people have been conditioned to put their own selves on hold for others. By taking time to be loving, kind and compassionate toward ourselves, we become stronger for those who need us to be loving, kind and compassionate toward them. Be loving. Be kind. 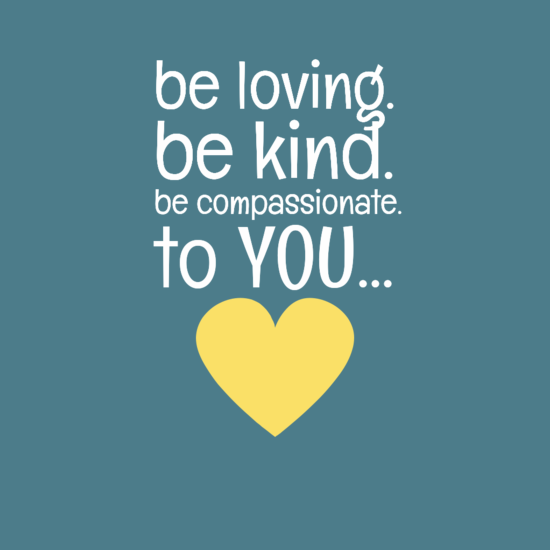 Be compassionate.